We all know that when travelling abroad, particularly when we have kids in tow, the journey can get a little arduous. Embarking on a holiday, regardless of the time of year, doesn’t have to set off the warning lights. Whether you’re planning a last minute half term vacation or hoping to get away for a winter break over Christmas, stay relaxed, chilled and stress-free so that the holiday happens without a hitch. Easier said than done? Not really. With a little advance planning, travelling can be made easy. Stay in a nearby hotel so you don’t miss your flight! There’s nothing worse than waking up on the morning of your flight, with suitcases not completely packed and your passport somewhere in the kitchen drawers. Trying to rally the troops can be a stressful time so why put yourself through it? Get everything packed up and ready to go the day before; put your important documents safely in your hand luggage and book you and your brood into an airport hotel for the night. If you’re flying from Heathrow, the airport hotel offers good sized family rooms at affordable prices, meaning you can start your holiday on a chilled note. On the morning of your flight, hop on the shuttle service which will take you directly to Departures. How easy is that? No need for car parking at the airport, no need for rushing furiously to get there on time. Just let the shuttle service do the work for you. With the hotel’s Wi-Fi, why not check in online? Save the hassle of the queues at the check-in desk and do it in advance. On the day, just drop your luggage at the baggage drop and off you go. All you have to do is float through security and kick back in the departure lounge. Before the day, be sure to check all the important documents. Can you imagine finding that your child has an out of date passport that you have forgotten to renew, the day before your holiday? The sheer thought of venturing to London to get a fast track passport is enough to send anyone into a panic. A little forethought will eliminate the risk – just keep track of the expiry dates. 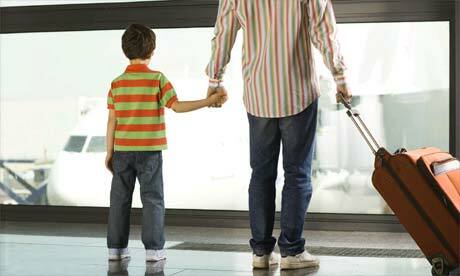 Remember, a child’s passport is only valid for 5 years, so you have to get them renewed more often than your own. For the onboard journey, be sure you have enough to keep the young ones happy. Everyone who is occupying a paid seat has hand luggage allowance – use it. The fabulous children’s suitcase, the Trunki, is conveniently sized to count as hand baggage and can be filled with all manner of toys, games and books to make the flight a little easier. Stock up on goodies before you reach the airport to save your cash. With the seasons changing and winter on our doorsteps, why shouldn’t you escape for a while with the children? From winter sun to an outdoor holiday in the mountains, enjoy a family holiday without any stress.